For the last week or so we have been closely watching a young foster child and, due to the toddler status, not much is getting done in the garden—but so it goes. The little one is having a hard time, but we are working together to help with the necessary support. Last week we had a touch of snow and with it came a hard freeze and some ice. Down here closer to the Willamette Valley floor we didn’t see much in the way of the white stuff, but the ice was fun to look at out of the car window. I couldn’t stop taking pictures of it as I waited in the car trying hard not to notice it was really cold. 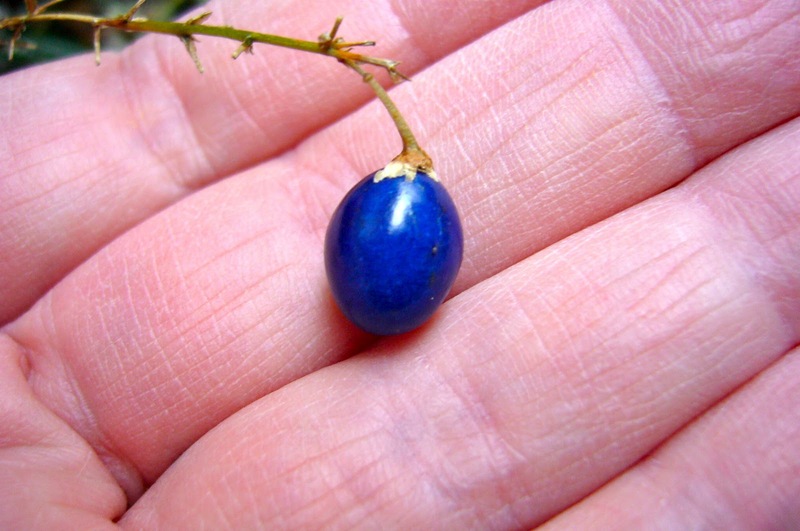 I spied this gorgeous little fruit/seed hanging off of one of my newer Mondo grasses and I had to get a picture of it. The color is really amazing. 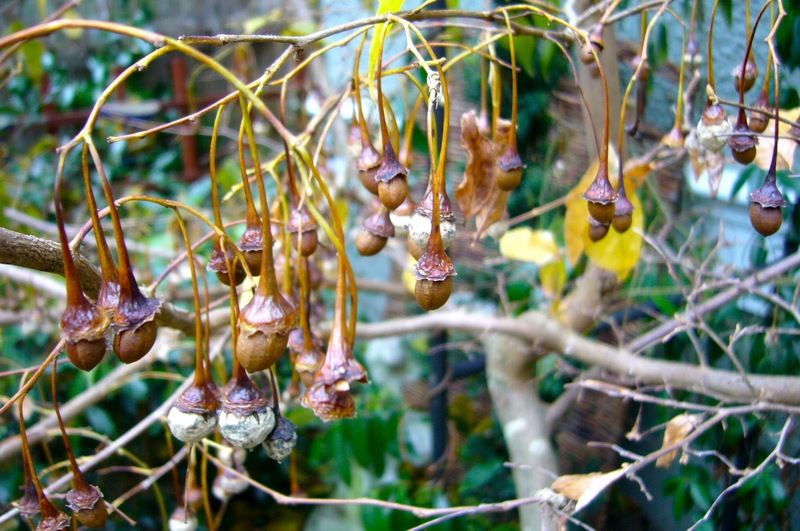 These are what’s left now of my Japanese Snowbell seedpods. The outer part froze off and now the seeds are just hanging on. I probably should collect a few more while I can. 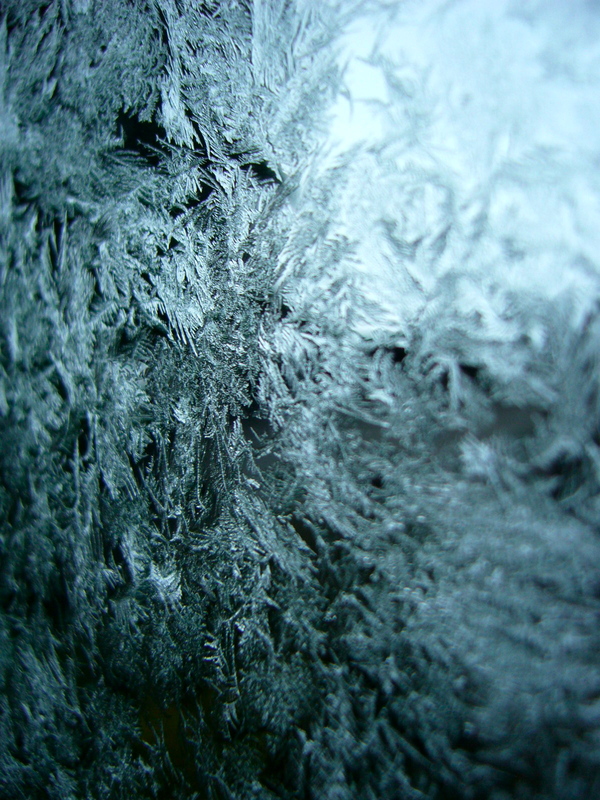 Ice kind of fascinates me. 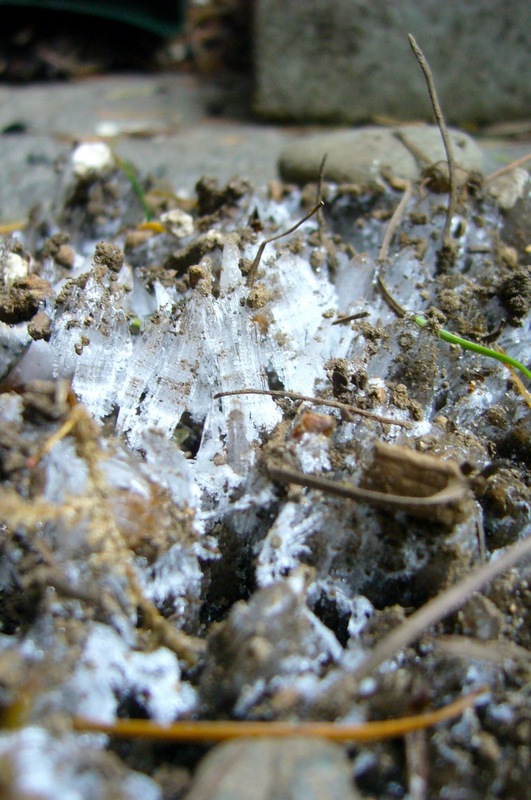 This is a small area where ice popped up and out of the soil. I used to know how it forms, but I can no longer recall. I am in awe of its beauty and mystery and that is enough for me. Since this is an area of soil that is heavily rained on due to the downspout nearby, the wet soil saturation should have something to do with its creation. My unfinished stuffed 12″ living obelisk, a small incomplete project overseen by St Francis in pint-sized form, appears to have acquired a new planting plan while I wasn’t looking. The mushrooms really cracked me up. 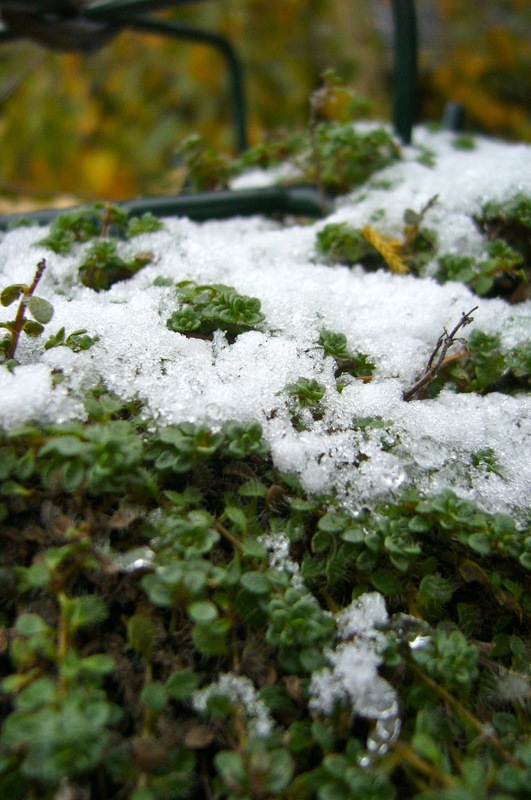 The snow has turned to ice on the globe planted with creeping thyme. Sometimes I too feel my snowy nature turning to ice and it is then that I close my eyes to imagine the sunshine warming my shoulders, and I turn, and I feel the sunlight as it heats my eyelids and I open them only to be blinded, happily. Not sure if I have complained about Hypothryoidism much, but it makes life for me very difficult during the coldest days of winter. Raynaud’s syndrome makes socks a necessity too at all times and even in bed when I am asleep I will get foot craps if I neglect to wear them. Winter is the hardest time. 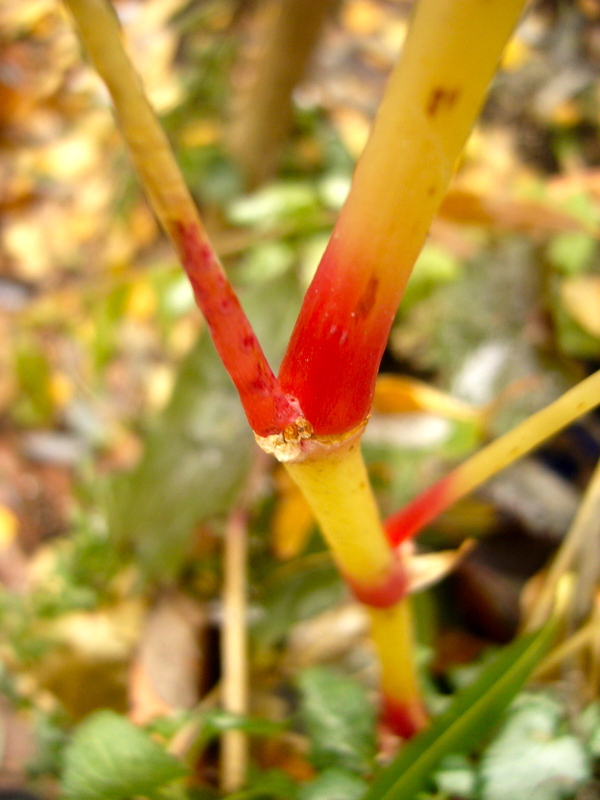 I caught the last embers of autumn along this frozen Begonia grandis stem before it warmed and collapsed. From a distance, it really was quite striking, a kind of garden graffiti I welcome. 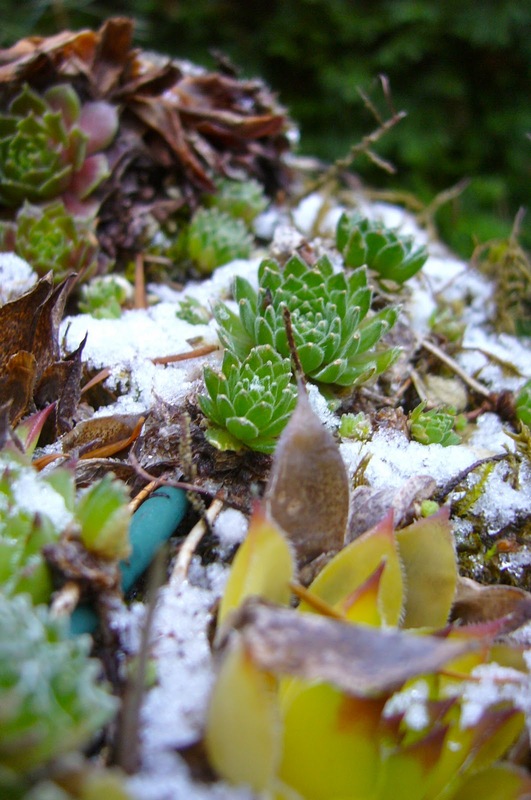 Frosted Hens and Chicks proving yet again that they are always alive. My ever watchful amulet. 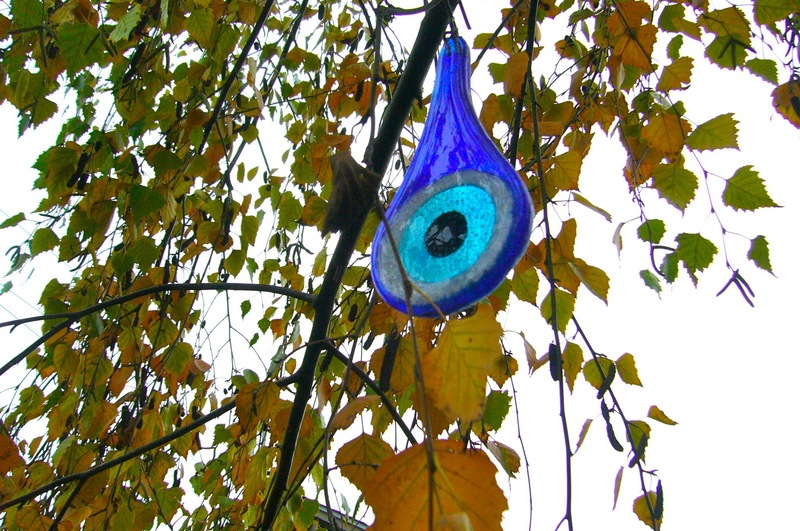 It is not the cornicello that so many Italian-Americans cherish, but it is the other evil eye amulet to protect against the evil eye. I suppose it is more akin to fighting fire with fire. 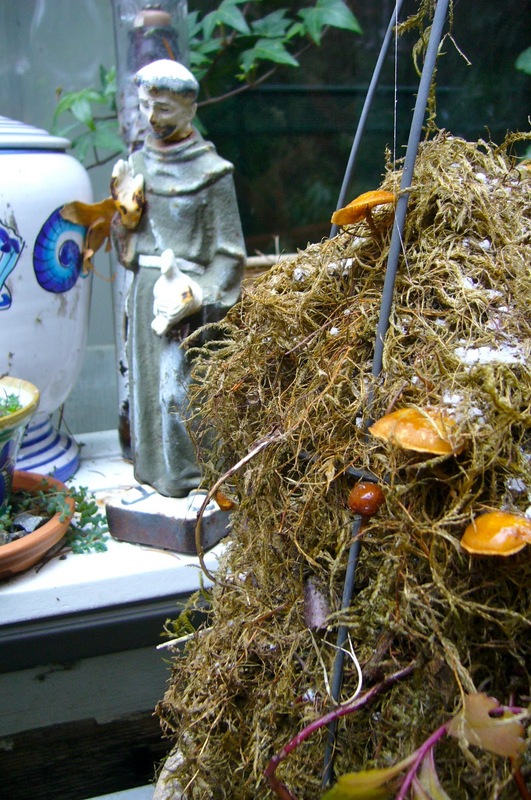 This was purchased last year at the Northwest Flower and Garden Show and I hope to buy another one this year when we go. It just glows in the right light. I do love this time of year, everything looks so pretty. However it makes work near imposable. 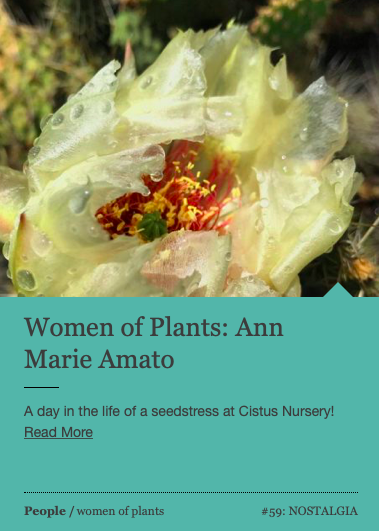 At least it means I have more time to read blogs 🙂 That fruit from the Mondo Grass is amazing, you could ware them as earrings! 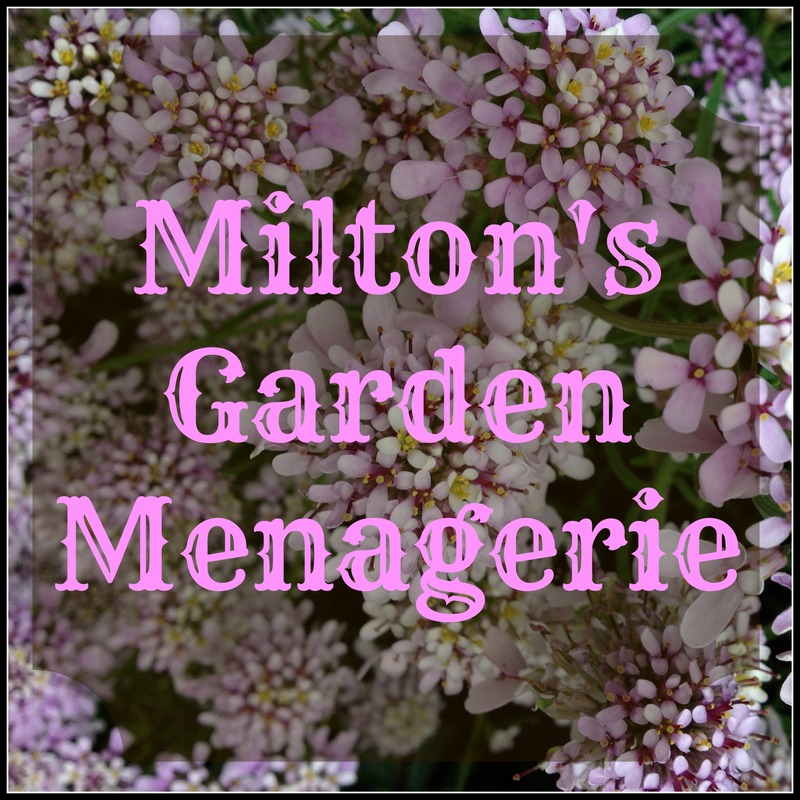 Considering the ice, you found a lot in your garden. I would say the same is true with foster parenting. You have to look beyond the obvious to help these little ones don't you?